IBM® HyperSwap® is the high availability (HA) solution that provides continuous data availability in case of hardware failure, power failure, connectivity failure, or disasters. 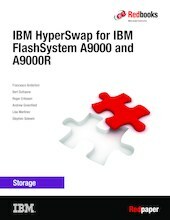 The HyperSwap capability is available for IBM FlashSystem® A9000 and IBM FlashSystem A9000R, starting with software version 12.2.1. Version 12.3 introduces a function that combines HyperSwap and Asynchronous replication, which creates a solution that entails HA and Disaster Recovery (DR). One side of the HyperSwap pair has an active async link to the third system, and the other side has a standby link. Known as Multi-site HA/DR, this configuration provides HyperSwap active-active HA while keeping data mirrored to a third copy to ensure two levels of business continuity. This IBM Redpaper™ publication gives a broad understanding of the architecture, design, and implementation of HyperSwap and Multi-site HA/DR solution. It also discusses and illustrates various use cases pertaining to their use and functionality. This paper is intended for those users who want to deploy solutions that take advantage of HyperSwap and Multi-site HA/DR for FlashSystem A9000 and A9000R.